GOOD MORNING my sweet friends & welcome to another "Inspiration Wednesday!" For those of you who are new to my blog, every other Wednesday my team & I make a project based on something that inspired us! For today, this pillow below that I have in my living room was the inspiration behind my card today! Ever since I purchased this pillow 2 years ago, I've been dying to make something using this color combo! As you can see, my card's color combo isn't EXACT, but I thought it was pretty close! I used some inks from Simon Says Store which were: Orange Peel, Schoolhouse Red, Sunshine, Dark Chocolate & Olive! The black ink I used for the lady bug & the sentiment is my Black Ranger Archival Ink. I just LOVE my newest set "Build a Pretty Flower" because you can use so many different colors & the flowers are STILL PRETTY! The sentiment is from my other new set called "Springtime in Paris!" Here is the card in it's entirety! I thought it would look pretty if I added some adhesive pearls that I had in my stash & also added the Clear Wink of Stella to all the flowers! WOWEEEE, I just LOVE what my team has done today!!! Also, just a quick reminder that there are only a couple of days left for the sale I have going on in my store right now! If you use the code APRIL2014, you will receive 20% off your entire purchase! The sale will end on Friday, May 2nd @ midnight PST! You can start shopping HERE! Awesome inspiration and gorgeous card Emma!!! Love the color combo and those flowers are my FAVORITE!!! Hope all is well in your household and hoping the boys are getting better! Good Morning Miss Emma I love your card the flowers came out so pretty and have to say your pillow is so gorgeous and definitely made me smile when I saw it because it so cute too. It's always fun when you and your DT share where the inspiration was taken from. I too hope your boy are feeling better and that you are staying well and everyone has been in my thought and prayers. Hope you have a great day!! Great inspiration Emma, Fantastic work ladies! Love all the cards. I love where you inspiration came from miss Emma. Hope the boys are feeling better. Emma, your card is gorgeous! I love the sparkly flowers - the pearls are the perfect touch! And the yellow ladybug is adorbs!!! 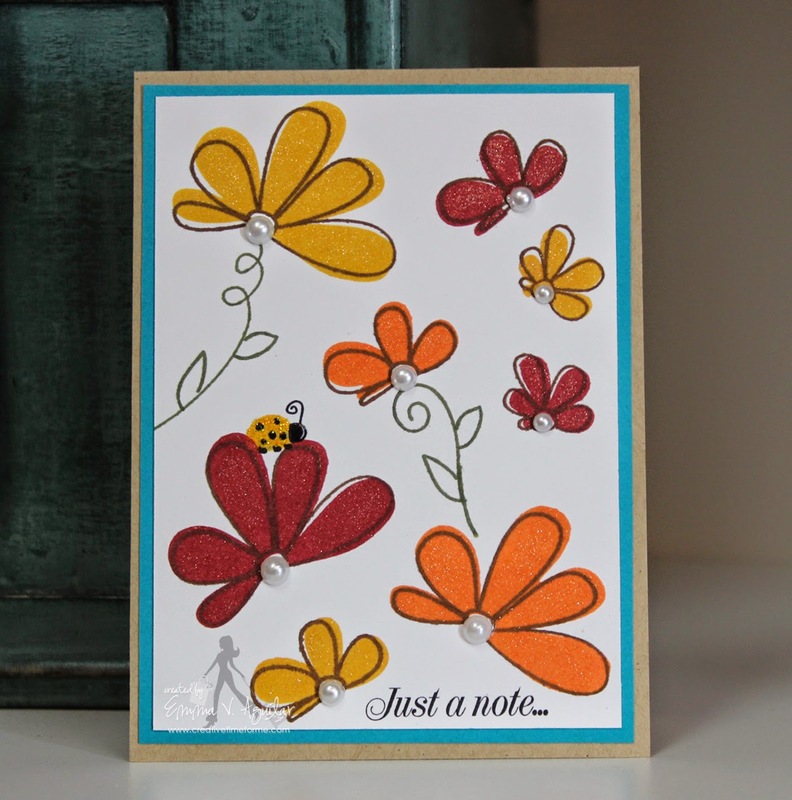 love your card and the colors! I can't wait to get my stamps!! Emma ~ Oh your card is so GORGEOUS! I LOVE those flowers and LOVE the colors! Great pillow ~ Pier 1?? LOL!!! 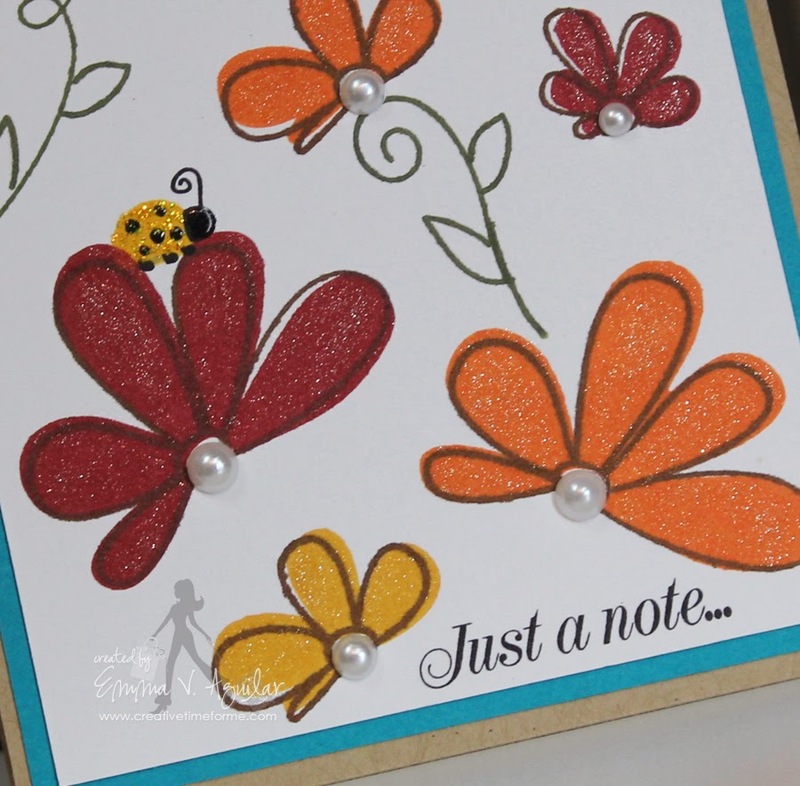 Of course the hint of glitter and oh the little yellow lady bug ~ ADORBS! LOVED all the projects today! Fabulous card Mrs. Emma, its super cute! 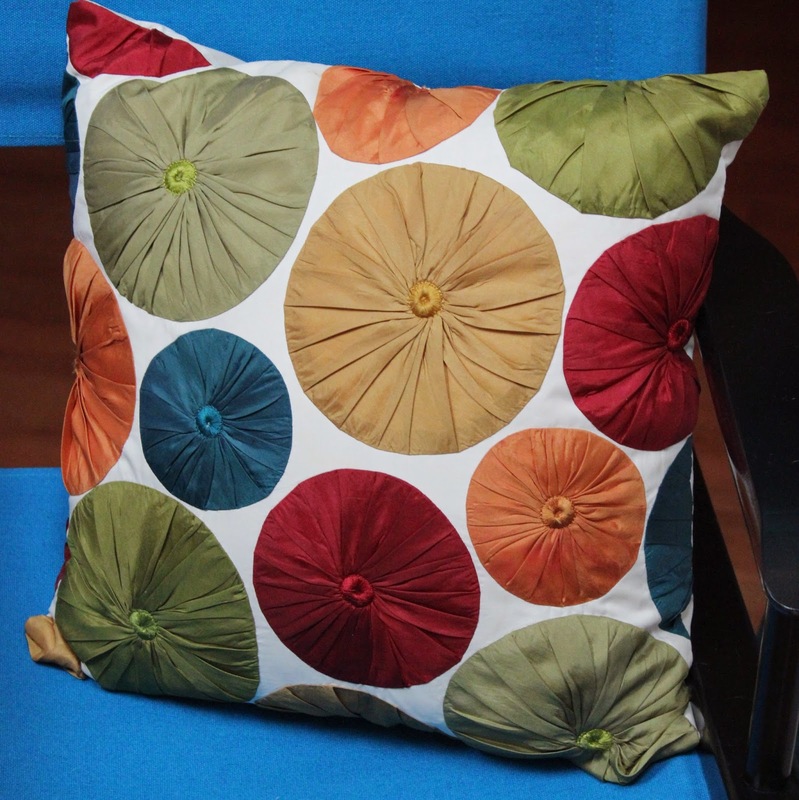 I love the colors and the pillow you got your inspiration from:) Great job DT, thanks for the inspiration. What great projects everyone had today. I like this inspiration day and reading how or why everyone was inspired. Fabulous job everyone.